The 25th UK Stata Conference (London) takes place on Thursday, 5 and Friday, 6 September 2019 at Cass Business School, London. The 25th UK Stata Conference is a two-day international event will provide Stata users from across the United Kingdom and the world the opportunity to exchange ideas, experiences, and information on new applications of the software. - surveys or critiques of Stata facilities in specific fields, etc. The deadline for submission of abstracts is 31 May 2019. The final programme will be announced before the end of July 2019. Please see below for further information about the User Meeting, including registration fees and reduced rates for paper presenters and students. Lunches, refreshments and all meeting materials are included within the registration fees. Timberlake Consultants, generously sponsors registration fee waivers for presentations (one fee waiver per presentation, regardless of number of authors involved). Timberlake will also pay a small fee to a presenter of a longer review or tutorial paper. Presenters need to register. We can also assist delegates with sourcing accommodation and other general inquiries regarding traveling or staying in London. To find out more and register for the meeting, please register on our events page here or contact us by email or call us on +44 (0)20 8697 3377. 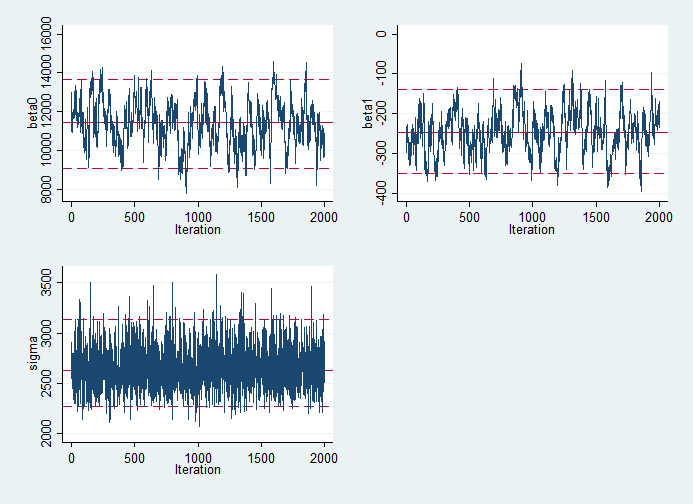 Click to view Stata's latest blog post "Calculating power using Monte Carlo simulations, part 1: The basics". In this post, we'll apply stintreg to a dataset from David Collett's textbook, "Modelling Survival Data in Medical Research" (3rd edition) (Example 9.4). This is from a real-life study that examined breast retraction, a side-effect of breast cancer treatment, and compared women treated with radiotherapy alone and those treated with radiotherapy and chemotherapy. You can download the data in CSV form here and follow along with this do-file. There are three variables: treatment group, start time of the interval (the last appointment at which there was no sign of retraction) and end time of the interval (the first appointment where there was retraction). First, let's visualise the dataset. Time is on the vertical axis, and the women are ranked by start time from left to right, in the two treatment groups. The exact time when retraction appeared is somewhere in the grey lines. Ideally, we would see a lower risk of retraction as grey lines stretching off to the top of the chart without red dots, and high risk indicated by red dots low down in the chart. But, it is hard to judge whether there are any differences. Let's fit some streg models, using naive approximations of the data so that they look like they are exactly known. First, we use the start time (the last retraction-free appointment). Now, we can see that the treatment group difference is quite large, and quite compelling in terms of significance. Note that, because the models are very different, we can't compare the log-likelihoods. Interval-censored data are everywhere. Being able to account for the uncertainty in the data gives more honest answers, not only by avoiding bias but by having the right level of uncertainty. If you fill in the "blank" with a single number, then you give Stata the false impression that the data are exactly known, and the inferences (p-values, confidence intervals) that follow will be falsely precise as a result. Tobit models are made for censored dependent variables, where the value is sometimes only known within a certain range. Chemical sensors may have a lower limit of detection, for example. In this blog post, we'll use some simulated data so that we know what relationships we expect to see, and they will be censored with an upper limit, or as the jargon goes, right-censored. Tobit models have been available in Stata for a while, but version 15 now includes multilevel versions with random intercepts and random slopes. Let's look at a simple mathematical representation. 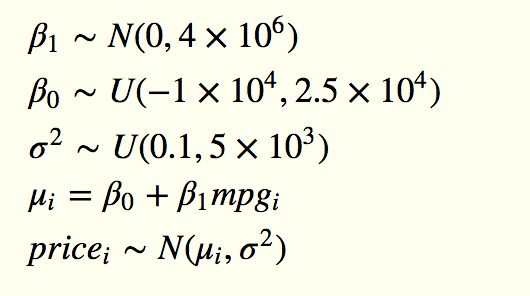 In these equations, i indexes the individual cases and j the clusters of cases that define the multilevel structure. That might be exam results clustered by student, or trees clustered by plantation, or whatever. One neat way of thinking about the advantage of multilevel models is that they split up the unexplained variance into observation-level and cluster-level variance, and in doing so, give deeper understanding and more nuanced conclusions about the data. x is an independent variable or predictor, y is the dependent variable or outcome of interest, but we don't observe y directly, only y*, which is the censored version at a threshold h. The betas are simple regression coefficients. Then, there is also a random intercept u, which is different for every cluster in the data's multilevel structure, and a random slope v, which contributes to the effect of x on y. The u and v values are normally distributed around zero, by convention. Let's create some simulated data for an imaginary research study into rehabilitation for amputees learning to use electrically-controlled prosthetic hands. The data are fake but inspired by real-life research. In these data, there are two training programmes being compared (variable: train) and the participants (identified by the variable: id) are tracked over several weeks (variable: week). They have to complete a test by carrying out four tasks of increasing difficulty (variable: task), and they are timed on the tasks (variable: time), so smaller time is desirable, but there is a maximum time of 30 seconds, so if they have not completed it within 30 seconds, then time is recorded as 30. This is right-censoring of the dependent variable. We also have to account for the repeated-measures (economists may say "panel data") nature of the data in a multilevel model. There will be a random intercept by id, and a random slope for week, and the study is principally interested in the interaction between week and train, because this would indicate a difference between training programmes in their impact on the rate of recovery (slope relating week to time). The code to generate these data is in the accompanying do-file. The graphs below show the individual "patients" as lines over time, split by the four tasks and two training groups. ...then we could just fit a familiar multilevel linear regression. Let's call it "Model 1". Next, we try the same linear regression, having censored our dependent variable above 30 seconds. The only thing we change is to replace y with ystar, which has any values above 30 replaced with exactly 30. This is "Model 2", and it effectively ignores the censoring, so we shouldn't be too surprised to get biased results out. In the table above, the highlighted cells show those parameters whose Model 1 values lie outside the 95% confidence intervals from Model 2. Many of these biases can be understood in terms of the data being pushed down to the red dashed line in the graphs above, and the linear model trying to compensate for that. But, when we use metobit (which has almost identical syntax to mixed) to fit "Model 3", we are asking Stata to integrate out the censored values over the part of the data distribution above the censoring threshold. That requires some assumptions in the model, and of course, this linear and normally distributed dataset fits those assumptions nicely, but in any situation where you are happy to use linear regression with the usual assumption of normal and homoscedastic residuals, it will be justified. Here, the biases of Model 2 all disappear, as seen in the table. We can use margins and marginsplot to help us interpret the model. You might notice that margins takes much longer with metobit than with mixed: we are asking a much harder task of the computer! From this graph, it's obvious that the bias in Model 2 has been very well removed by the multilevel Tobit in Model 3. The do-file for this example can be downloaded here. In this post, we will look at a couple of community-contributed commands for fitting Bayesian models to your data. Stata 14 introduced Bayesian functionality for the first time with bayesmh, and version 15 took this further with the bayes: prefix, which can conveniently be added before calling any of 45 estimation commands (just as you might type bootstrap: or svy:), but you can also fit bespoke models with external, free software: BUGS, Stan and JAGS. Why would I need anything other than Stata's Bayesian commands? BUGS, Stan and JAGS have been around since before Stata's bayesmh and bayes:. They used to be the only way to fit these kinds of models, so you might well find that someone has written code for one of them that you can easily adapt to your needs. In particular, The BUGS Book and the Stan manual and case studies contain many examples of specialised models, and wise advice on adapting it. 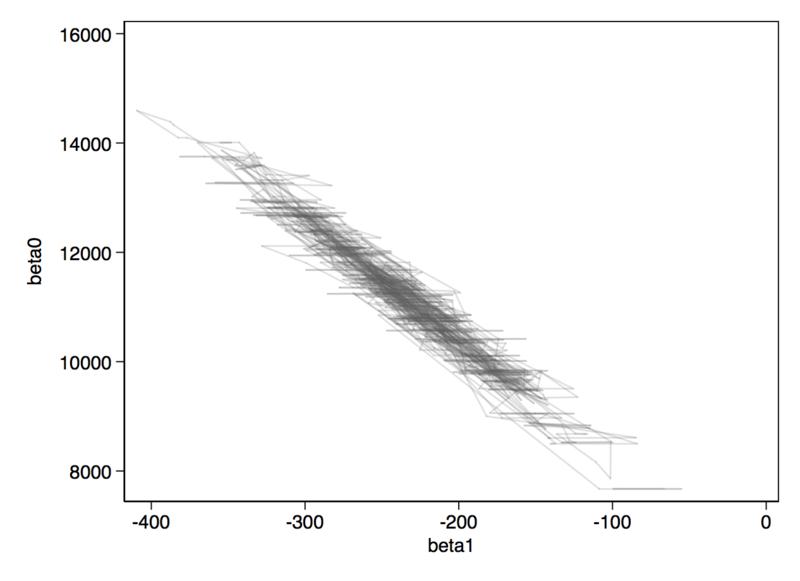 Also, there are some kinds of model that Stata can't fit. At the time of writing, this includes imputing of missing or censored data inside a Bayesian model, Gaussian processes, or geospatial models. Then, follow the instructions in the readme.txt file to complete installation. You will need the WinBUGS folder location, so read on if you haven't already installed it. To work with JAGS, you will need the experimental v2 versions of these commands. We won't go into them in this post, so there's no need to install them now, but I do suggest you consider JAGS in preference to BUGS, as a more actively-maintained and used piece of software, and one that works on all operating systems. If you are familiar with the version control software, Git, you might prefer to clone my GitHub repository to get all the files in one place, as well as the experimental v2 versions, which we'll discuss below: git clone https://github.com/robertgrant/winbugsfromstatav2 If you don't do git, you can just point your browser to https://github.com/robertgrant/winbugsfromstatav2/archive/master.zip and unzip this into your personal ado path. (What's my personal ado path? It's a folder on your computer where your own Stata commands get added, like stuff you install from SSC. You can find it by typing in Stata: sysdir, then looking for the PERSONAL directory. This package was originally aimed at running WinBUGS, a graphical user interface to the BUGS program that the Medical Research Council Biostatistics Unit in Cambridge created for Windows computers, and some years ago stopped actively developing. You will need to install WinBUGS if you want to use it (there are instructions here). If you are not using Windows, or just want to use OpenBUGS or JAGS (which both run the same algorithm, the Gibbs sampler, but unlike WinBUGS, do not have a graphical user interface), then you will need to work with John's experimental v2 commands. They are included in my GitHub repository. You will find instructions to install OpenBUGS on Windows or Linux (there is no guarantee that the Linux version will behave as expected on Mac) here and JAGS here. My personal advice is to use JAGS, which is actively maintained and has a large pool of expert users, who are likely to have detected and fixed any problems before you encounter them. JAGS is the only option for Mac anyway. If you are considering using JAGS, check out John's blog post on the (relatively minor) differences. Once you install JAGS, look in the Readme.rtf file that is installed to find the location of the executable program on your operating system. You will need to tell Stata this location. To use Stan, you need to install CmdStan, and there are instructions here, particularly in Appendix B of the CmdStan manual. Note that, for Windows, you should install RTools as well, and at the time of writing, it may be best to avoid CmdStan 2.18.0, which has a lot of speed improvements but many Windows users have had problems installing it. Like JAGS, you need to know where it has been installed on your computer, so that you can tell Stata when you run it. The first three lines are the priors, the fourth deterministically sets the linear predictor mu, given values drawn from the priors, and the fifth defines the likelihood. In BUGS, JAGS or Stan, you specify the model in individual statements like this. There are some ways of specifying this model inside the do-file, but to keep it simple, you can just type it up inside WinBUGS or a text editor (like Notepad, Atom, Sublime Text, vim, or whatever). Here, I saved it as autommodel.txt. The rest of the files that WinBUGS will need are generated for you by John Thompson's excellent commands. wbslist or wbsarray can be used to write your data out into a text format. In my experience, you need to use the format option to get readable results. wbslist will also write out the initial values. Here, we are just running one chain. wbsscript writes the script file for WinBUGS that tells it where to find the model, the initial values and data, how many iterations to run, and so on. If you know MCMC analysis, the options are pretty self-explanatory. The noquit option keeps WinBUGS open, and Stata won't proceed until you shut it, which is handy while you are debugging and getting your code right. Having obtained your results by running wbsrun, wbscoda reads the iterations of the Markov chains into Stata, which you can summarise statistically with mcmcstats and visually with mcmctrace, as well as other approaches. Below, you can see the traceplots from mcmctrace, then a bivariate trace where we simply get a line chart of the two betas, which we expect to be quite strongly negatively correlated. If you wanted to use OpenBUGS instead, you can just add the openbugs option to your wbsscript, wbsrun and wbscoda commands. Thompson's v2 versions of the commands are an experimental approach to extending this to JAGS. They have not been fully tested so you should use them with caution. For a very simple example with only 74 observations and 3 parameters, Stan takes notably longer than BUGS. As the size of the problem grows, or as parameters become more correlated, or as the priors become more bespoke (non-conjugate), Stan will win on speed. The load option reads the chain back into Stata, and then we can generate traceplots and a bivariate trace on the betas. The do-file for all the commands (except installations) in this post can be downloaded by clicking here. In time series analysis, sometimes we are suspicious that relationships among variables might change at some time. The new threshold command allows you to look for these changes in a statistically informed way, which helps you avoid the potential for bias if you just eyeball line charts and pick the point that fits with your expectations. Here's a simple example. The goldfinch is a small songbird found throughout Eurasia. In these population data from the United Kingdom, you can see a sudden change in the time series at around 1986. This is generally ascribed to the birds learning how to forage in suburban gardens. Prior to that point, you might have studied the effect of the size of field margins on farms on the goldfinch population, on the basis that the birds eat seeds of wild plants that grow on the margins of cultivated land. The post-1986 data would throw your analysis out; the birds near human habitation were no longer totally dependent on wild plants. Identifying the threshold and fitting different models on either side allows you to improve causal understanding or prediction. Let's look at a fairly small dataset: a few weather variables from an observation station to the South of London in August 2018. You can download the data file here. We will open the file (I suggest you browse it to see what's inside) and declare it to be a time series. Next, we make two new variables: decimalday will be handy for plotting, and hoursine is a quick and dirty way of incorporating the daily oscillation in temperature, with minimum about 5 a.m. and maximum about 5 p.m., fairly standard in an English summer. We are imposing a sinusoidal shape on this oscillation, and fixing the time of the minimum and maximum, which is not a great idea for time series analysis, but will simplify what follows and allow us to focus on the threshold command. If we regress temperature on hoursine, we can evaluate the size of the diurnal variation. Bear in mind that hoursine varies from -1 to 1, so the coefficient tells us the average change from 5 a.m. to 11 a.m. or 11 a.m. to 5 p.m. This change is 3.2 degrees Celsius, with 95% confidence interval from 2.8 to 3.6. The intercept term can be interpreted as the average temperature at 11 a.m. (17.2 degrees, confidence interval 17.0 to 17.5). If you compare this to the line chart for temperatures, the size of the sine wave looks fairly sensible, but it is centered around 17 degrees, when actually the month started with temperatures notably above that, which then dropped around the 8th of August to be below that. Looking more closely, the period before the 8th seems to have larger amplitude (height of the wave) than after the 8th. Really, we need to consider at least one threshold point. To run the corresponding threshold regression, we can simply type threshold temperature, threshvar(decimalday) regionvars(hoursine). 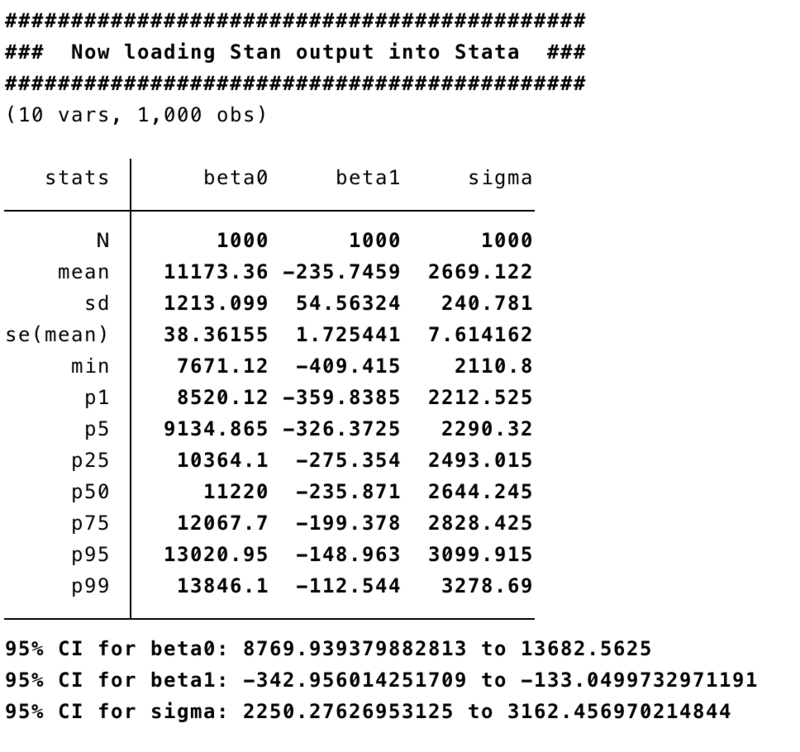 threshvar tells Stata which variable to use to detect the threshold location(s) and regionvars tells it what variable(s) will be used as predictors on either side of the threshold(s). threshold fits linear regressions (I'll discuss later what you can do in non-Gaussian error situations), and it runs a fairly exhaustive search along the range of threshvar, fitting 557 regressions in this case. Fortunately, linear regressions are fitted by simple matrix algebra and are hence very fast. The default is to look for one threshold, but we will extend that later. The output includes Akaike information criterion (AIC), Bayesian information criterion (BIC) and Hannan-Quinn information criterion (HQIC); BIC in particular allows inter-model comparisons. This is helpful if you want to compare a model with one threshold to a model with two, for example. There is also a sum of squared residuals (SSR), which is 4908 for one threshold. We can compare this will the simple regression above, where the sum of squares (SS) residual is 9342 – a big improvement! The threshold itself occurs on the night of 7-8 August (decimalday = 7.875), which is indeed the most obvious changepoint in the time series. In fact, this coincides with a cold front moving over the area after a record-breaking period of hot, dry weather. Visualising the new model's predictions, we can see it does much better, although there might be a case for subdividing the period after the 8th further. The accompanying do-file shows how the number of thresholds, and their locations, can be extracted into Stata macros and reused, for example in graphics, without hard-coding their values. To allow for more thresholds, we can just add the option optthresh(4). After 4 scans through the data, we get four threshold points. The residual sum of squares is shown as each one is added, ending at 3138 with a BIC of 1114, notably lower than the 1386 of the one-threshold model. The chart below shows their locations in purple, with the one-threshold model's location in orange (overlapping one of the purple lines). The new model clearly has predctions that more closely follow the observed data, and this is supported by the BIC, although the reduction in residual sum of squares does not always decrease as more thresholds are added, so we should be cautious about adding these additional thresholds. I'll come back to this point at the end. Now that we've seen the basics of how threshold works, let's try it out with a more realistic regression. In the weather data, we might want to predict temperature based on hoursine, as well as the lagged values of humidity and pressure_change. This has put the one threshold much later in the month, probably because the disturbance in temperature around the 8th is adequately predicted by disturbances in humidity and pressure too. 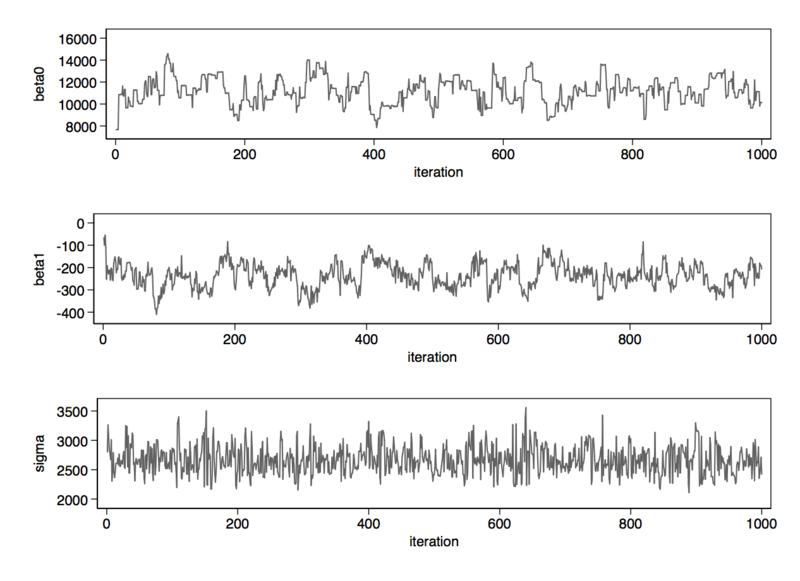 The observed and predicted plot looks like there are a couple of short periods of systematic over- or under-estimation. The coefficients change quite a lot, and some predictors move to having high p-values, in some of the regions. A closer examination of what this means to an expert in weather prediction would perhaps help to trim the thresholds. How could threshold regression be used for model building in practice? As we've seen, threshold regression is an exploratory technique and the final choice of model has to be taken by the analyst, taking theory into consideration alongside the stats like BIC and residual sums of squares. There is potential to overfit, especially if you set optthresh to be quite high, which is really no different to any other model building procedure. In the weather data, although I am no meteorologist, it seems justified that there is a threshold as the cold front arrives (which has been suggested in both these regressions), and perhaps another after the band of rain has passed – where there is high and aperiodic humidity in the 9-11th – (which was not suggested by threshold), replaced by colder air and showers. Beyond that, later thresholds are questionable. The best way to guard against that is to plot your predictions and residuals and look for patterns that can refine your model. If possible, split your data into a training set (that you run threshold on), and a test set (that you apply the training set's model to). With this cross-validation approach, you can quantify the effect of increasing optthresh. What about non-Gaussian errors, or when the dependent variable is a count or binary? Although threshold only tests for thresholds in linear regression (with the usual Gaussian, homoscedastic and independent errors), if you regard it as an exploratory technique pointing the way to a more detailed model, then there is no reason why you could not use it to get a selection of candidate thresholds. Suppose you have count data and intend to fit a Poisson model. If you take logarithms (adding a small number to avoid log(0), you could run threshold and then try out the thresholds in poisson. Non-Gaussian errors might give you incorrect standard errors but still provide reasonable coefficients and thresholds, to be properly evaluated in a more robust model. You will just have to be careful to spot any outlier residuals or clumps of outliers, that might induce a threshold where there really isn't enough evidence to justify it, given the "true" residual distribution.